We’re back with 5 more things you should know before your first appointment! We often have brides ask to try on gowns that are drastically outside their budget. We are fine with putting you in the gown of course, but the worst part about our job is seeing a heartbroken bride because she fell in love with a gown she couldn’t afford! Once we’ve taken your measurements and explain sizing to you, please don’t get caught up in the number! Bridal sizing typically runs small, and loves to make you feel bad about yourself. Just go with the flow and pretend that the numbers don’t exist! Your gown can be whatever you want it to be. You can then make the details of the wedding match you, not the other way around. It’s important to feel confident in what you’re wearing the entire night instead of worrying if your gown reflects your venue! Time and time again we have brides who wait for that big emotional meltdown to confirm that the gown they love is THE ONE, but not every bride does. 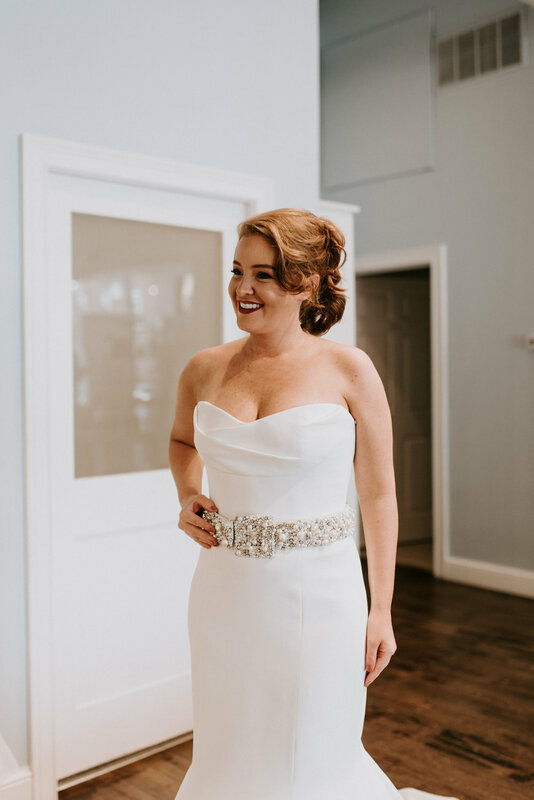 Your bridal gown is absolutely one of the most memorable clothing purchases you will ever make, but its ultimately just another piece of clothing. Do you cry when you find the perfect pair of jeans? Probably not, you just know they are the winner because of how you feel in them! And if you do cry, that’s perfectly normal too! We all express our emotions differently. With all the planning and stress that comes along with the wedding, your bridal gown shopping experience should be the most fun (except for the big day of course)! It’s okay to be nervous but don’t stress yourself out too much. You’ll find the gown, don’t worry! Trust your wedding gown intuition! You’ve got this + we are here to help you any way we can. Now you’re all ready for that appointment, babe! We can’t wait to help you find your dream gown! Sign up to stay updated on all the pretty!